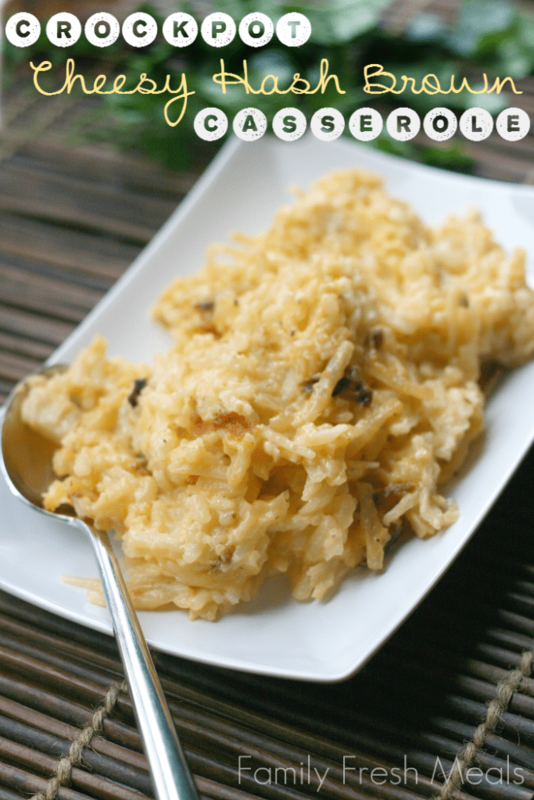 A cheesy side dish or a fun breakfast! Darryl requests my Mom’s Cheesy Hash Brown Casserole all the time. It is one of his all-time favorites. 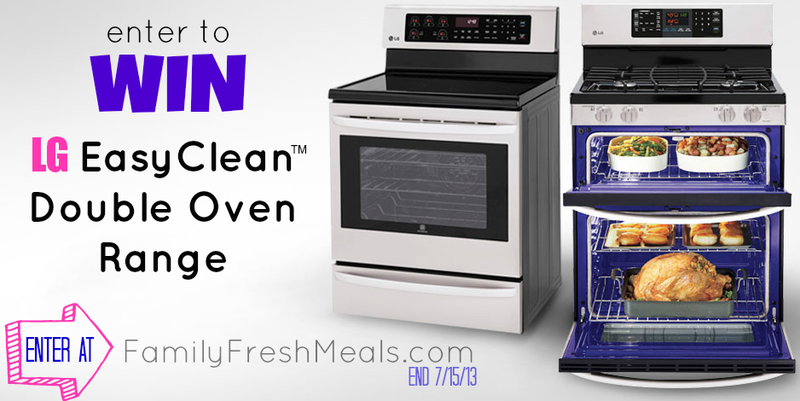 But in the summertime, who wants to heat up the house using the oven? Not this gal. So I decided to try and switch things up a bit, and make a Crockpot Cheesy Hash Brown Casserole. Perfection! The same yummy taste without a unbearably hot house. 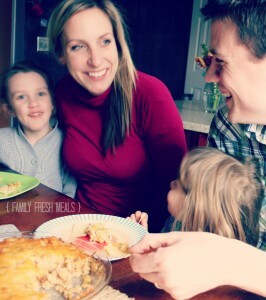 Not only is this Crockpot Cheesy Hash Brown Casserole a great side dish, surprise your family with this cheesy goodness for breakfast! 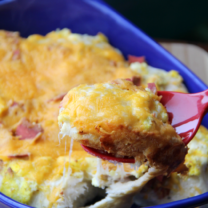 Pair with some protein packed eggs and fresh fruit…..BAM! A breakfast your family will be talking about for weeks. 2. In a large mixing bowl, mix together hash brown potatoes, shredded cheese, sour cream, cheese, seasoning, salt and cream of potato soup. Stir until well combined. 3. Place in a crockpot, prepared with cooking spray and cook on LOW for 5-6 hours. Mine were perfect at 5 hours. Place in a crockpot, prepared with cooking spray and cook on LOW for 5-6 hours. Mine were perfect at 5 hours. Here is what I used to make this dish! I never thought to make it in the crock pot!! I usually make mine with a can of cream of chicken soup instead of potato. And try a sweet onion or a Vidalia instead of red, what a burst of flavour!! I made this for 4th of July along with shish kebabs with marinated steak, marinated chicken, bell peppers, and onions (grilling indoors due to fire danger in Colorado). 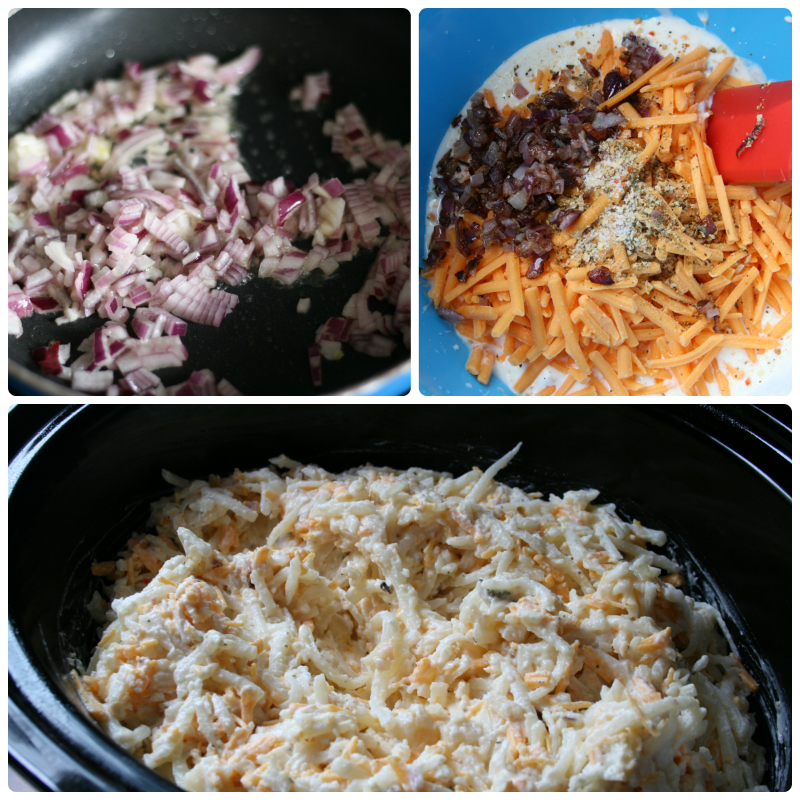 Family loved the cheesy hash browns; I loved making this in the crock pot! Left overs were great the next day with ham and eggs. I used extra sharp cheddar, cream of chicken, and yellow onion. I know my family will be asking for this all the time. Thanks for this great recipe! Yay Kim! I am so glad the family loved it. Your 4th of July feast sounds amazing!!! Ive pinned to my Breakfast Recipe board. This looks delicious. I’m going to have to try making it for my family one night. I have a 6 qt. crock pot. Will that be too big for this recipe? So these are thawed out in the refrigerator before mixing and cooking, correct? I used refrigerated hash brown potatoes… so I just used them straight from the refrigerator. If you are using frozen, I would probably thaw them out in the fridge overnight. I’ve used frozen for years and have never thawed them out first. They work just fine, even at the same time in the crock pot! This looks delicious! I don’t see a crockpot size recommended; will it fit in a 3.5 qt. crockpot? Planning on bringing it to a get together this weekend. That might be a little small. I would recommend a little bigger. Maybe a 4/5-6 quart. If you only have a 3.5 I would just 1/2 or 1/3 the recipe. Hope that helps! Thank you Corey for your incredibly FAST response! I will halve the recipe as you suggested; thank you for your help! Thanks for the recipe! I’m going to make these to take to my mom’s for Easter. We have an hour drive so this should work great to take! Could I use fresh diced potatoes in this recipe? 40oz of frozen hash browns…. how many pounds/cups of fresh would that be? I made these for Memorial Day. I added bacon, because who doesn’t love bacon. They were great! I use 1/2 cup of Durkee’s French Fried Onions mix into the casserole. During the last 15-30 minutes, I sprinkle a layer of Durkee’s French Fried Onions on top. Um, Um, Good! You mentioned your Mom’s Cheesy Hash Brown Casserole at the beginning of the post.. do you have that recipe on your site? This looks amazing, but I’m curious about a non-crockpot adaption. How long would would this bake in the oven for and at what temp? 350 degree’s for 1 hour. i loved this!! i used frozen hashbrowns and added rotisserie chicken yum!!! 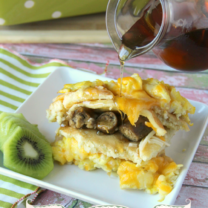 I am curious about this too… I want to make them for a breakfast potluck for work. I can’t decide if I should cook in advance and reheat, or if I could cook them on high for 2 hours that morning. This was an awesome find!! I needed to make a side dish of cheesy potatoes for a group dinner of about 15-20 folks but only had a 2.5 quart crock so I was stressing. I had given away my 4 and 6 quart crock before downsizing from a home to a condo 1/2 the size. I found this recipe and it looked like a winner. Yes!! I was able to use 1 20 oz bag of refrigerator potatoes plus a few big handfuls of the second bag, used just short of 1 cup of sour cream and almost 2 cups of cheese. I used the whole can of condensed potato soup and somewhere around a 1/3 of a cup of sauted onions. I did add 2 slices of bacon as someone else suggested and some other spices that I had on hand. I added a bit of shredded cheese on top so I could gauge how the dish was heating. I did cook this on low for 5 1/2 hours (the start of dinner ran late) and the potatoes were just a little bit crispy on the bottom but just a tad. I did stir after 4 hours since I was still stressing on how this might turn out. This dish was an absolute hit!! There were some crispy pieces left at the bottom of the crock but those were quickly scarfed up by a couple of folks!! Since I will stick with just a 2.5 quart crock, which is really the right size for a side for a group dinner, I will probably adjust the time to right around 4 hours. Thank you for such an awesome crock recipe find!! Just wanted to thank you for such a great recipe! It has become an absolute must for holiday meals with my family. I did adjust a few things. I use Cream of Chicken With Herbs, a little less sour cream, mixture of cheddar/jack cheese, extra butter. (Sometimes I spoon some into a casserole dish after they’re done, put more cheese on top and under the broiler.) I gave my husband a choice between these potatoes or mashed potatoes and gravy for our Thanksgiving meal tomorrow and within a half a second he texted one word: “Cheesy!” My sons are with their Dad this Thanksgiving, but I had to promise to make this again at Christmas. I love having a recipe that everyone loves, looks forward to and will identify with our family’s holidays for the rest of their lives. Thanks again! Also…love having a holiday crock pot recipe that helps me free up valuable oven real estate!! P.S.S. I meant to give it 5 stars but missed the chance! You’re welcome! Happy Thanksgiving to you and yours. I am thinking of making this for my son’s highschool wrestling team for our Saturday tournaments that last at least 7 hours, I would need to make an extra half recipe to this since these boys are trying to make weight all week and are usually starving by Saturday. Do you think if I cooked it from about midnight til 5 am which is close to leaving time that once I get to the meet at 8 and put it on low for the day it will be ok.
That sounds like a good plan Brandie 🙂 I would just keep an eye on it towards the end to make sure nothing is burning. You sold me on two things…potato soup and BAM!!! This filled my 6qt, so I would worry about doubling it with just one crockpot Shelley. By chance do you have 2 crockpots? I never seen answer above on using raw potatoes instead of the refridgerator or frozen potatoes. Has anyone tried using fresh raw potatoes? Do you know how many used? 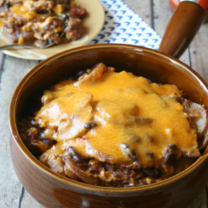 Will an 8 qt crockpot work and the cooking time be the same for a double recipe? Also, will it hurt to turn off (for approx. 40 min.) and transport to another location to finish cooking? Going to make these Easter Brunch….only question…..so I add the cup of water when using the condensed soup? No one has mentioned that I can see……need an answer for tomorrow……hope i get one as I don’t want to mess up this recipe……..and thinking the sodium might be too high without the water. Is there a way to save recipes I like so I don’t have to go hunting when I’m ready to make it? Do you use Pinterest? You could pin the individual recipes you find on my site. Yes when you hit the print button it will take you to a page were you can select your printer. Usually your printer is already selected and you can choose how many pages etc.., there should be a selection menu for your printer where you can choose PDF. When you choose that it will change the PRINT button to SAVE and you can select where to save it to. I created a folder called Recipes on my desktop just things like this! Hope this helped! This is almost the same recipe I have for the oven and everyone loves it so I am very excited to try it for Thanksgiving tomorrow! So hard to cook this dish when there is a turkey in your oven! I will be using 1 bag of regular Simply Potatoes and 1 bag of Herb and Garlic and omitting the spices. For a bit spicier dish try using a bag of the Southwestern Simply Potatoes! We have done that too.